Joint operation planning occurs in a networked, collaborative environment, which requires dialogue among senior leaders, concurrent and parallel plan development, and collaboration across multiple planning levels. Clear strategic guidance and frequent interaction between senior leaders and planners promote an early, shared understanding of the complex operational problem presented, strategic and military end states, objectives, mission, planning assumptions, considerations, risks, and other key guidance factors. This facilitates responsive plan development and modification, resulting in constantly up-to-date plans. The focus is on developing plans that contain a variety of viable, flexible options for commanders, and in the case of top priority JSCP tasked plans, for SecDef to consider. The Joint Strategic Planning System (JSPS) is the primary system by which the CJCS, in coordination with the other members of the Joint Chiefs of Staff (JCS) and the CCDRs, conducts deliberate planning and provides military advice to the President and SecDef. 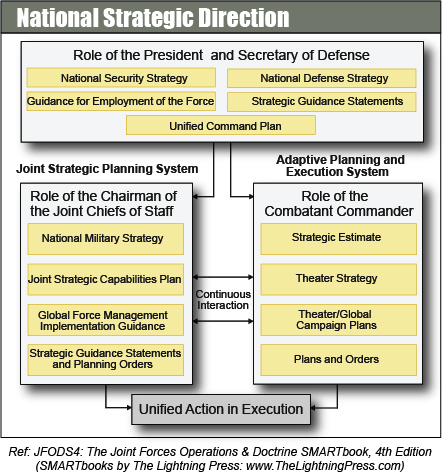 JSPS products—such as the National Military Strategy (NMS) and the Joint Strategic Capabilities Plan (JSCP) provide guidance and instructions on military policy, strategy, plans, forces, and resource requirements and allocations essential to successful execution of the NSS and other Presidential directives. The Joint Strategic Planning System (JSPS) is the primary system by which the CJCS, in coordination with the other members of the Joint Chiefs of Staff (JCS) and the CCDRs, conducts deliberate planning and provides military advice to the President and SecDef. The NMS, derived from the NSS and NDS, prioritizes and focuses the efforts of the Armed Forces of the United States while conveying the CJCS’s advice with regard to the security environment and the necessary military actions to protect vital US interests. The NMS defines the national military objectives (i.e., ends), how to accomplish these objectives (i.e., ways), and addresses the military capabilities required to execute the strategy (i.e., means). The NMS provides focus for military activities by defining a set of interrelated military objectives and joint operating concepts from which the Service Chiefs and CCDRs identify desired capabilities and against which the CJCS assesses risk. Subordinate to the NMS are branch national military strategies. For example, the National Military Strategy to Combat Weapons of Mass Destruction (WMD) further develops the combating WMD guidance in the NMS by establishing military strategic objectives and military mission areas, and defining the guiding principles and strategic enablers for the military’s role in combating WMD. The JSCP is the primary vehicle through which the CJCS exercises responsibility for directing the preparation of joint plans. The JSCP provides military strategic and operational guidance to CCDRs, Service Chiefs, CSAs, and applicable defense agencies for preparation of campaign plans and contingency plans based on current military capabilities. It serves as the link between strategic guidance provided in the GEF and the joint operation planning activities and products that accomplish that guidance. In addition to communicating to the CCMDs specific planning guidance necessary for deliberate planning, the JSCP also translates strategic policy end states from the GEF into military campaign and contingency plan guidance for CCDRs and expands guidance to include global defense posture, security cooperation, and other steady-state activities. The GFMIG is a critical source document for force planning and execution. The GFMIG integrates complementary assignment, apportionment, and allocation information into a single GFM document. GFM aligns force assignment, apportionment, and allocation methodologies in support of the NDS, joint force availability requirements, and joint force assessments. It provides comprehensive insights into the global availability of US military resources and provides senior decision makers a process to quickly and accurately assess the impact and risk of proposed changes in forces assignment, apportionment, and allocation.